Appearance (0-20): The overall impression is very well done. 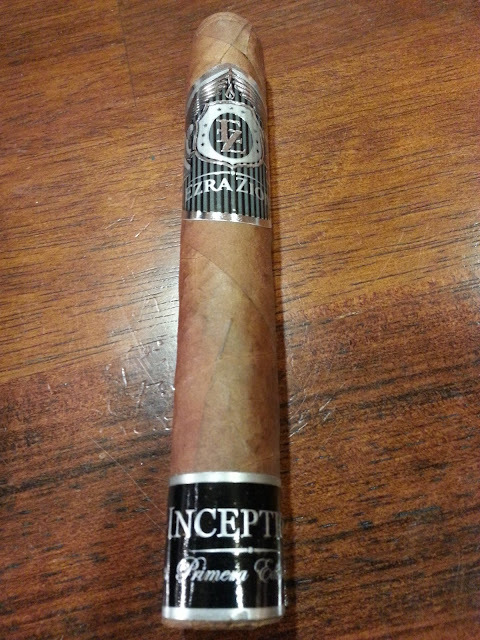 For a cigar that you don't know much about, the band really can push you towards a purchase. The main band silver and blacks, with a pretty cool logo design. The band on the foot follows suit, but tells which line it is from. After reading a write-up from another blogger, the Inception will be changing to the JAMIS Vu. As for the cigar itself, there are a few small veins and the wrapper is very grainy. Construction (0-20): For the most part, the construction was well done. In this review from stogies on the rocks, his ash held on for quite awhile. Mine on the other hand was a bit different; the ash was somewhat flaky, and ended up falling off by itself after only an inch. Not a big deal for me, since the cigar burned well the whole way through. The smoke was very thick, and the draw was just right. It burned pretty cool, which doesn't always happen with a small smoke. Strength (0-20): No real nicotine hit for me, so it probably would sit in the medium range. Flavor (0-20): The cigar started off pretty spicy. It wasn't knock your socks off, but it really sat on your tongue to give you the spice. This was consistent for the first inch or so until the ash fell off, and then it moves to the heart of the smoke. The middle section has strong wood notes, still some remnants of spice, and a bit of fruity/floral flavors. I couldn't pinpoint the specific flavor, but there was some kind of sweetness involved. 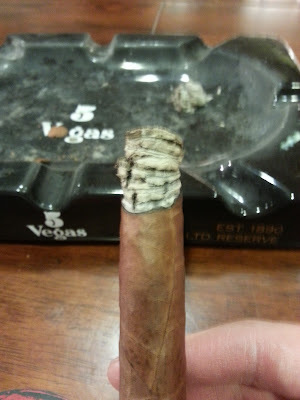 For the remainder of the cigar, the spice was completely gone and was left with the woodiness and fruit. Value (0-20): Coming in at $8.00, its a fair price to pay. When looking at your premium cigars, you are looking anywhere from $5 to $10. The only problem in that price range, is there is a plethora of options. While not bad, I would like to see some more differentiation. Overall (0-100): The overall experience was a pleasant one. Its one of those cigars that I would just sit back and enjoy, but you also have the option to really taste the flavors. I did enjoy the fruit, and would like if the spice stuck around for the entirety of the smoke. 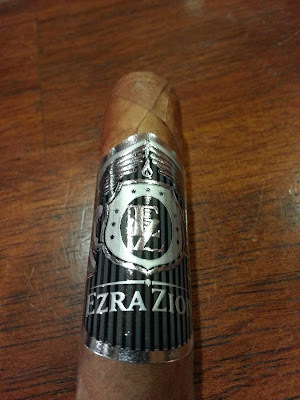 I've only smoked 3 Ezra Zion cigars, and all of them have been very well done. Unfortunately, its only been 1 cigar of each. I'd like to smoke some additional ones in the future, and revisit some review. 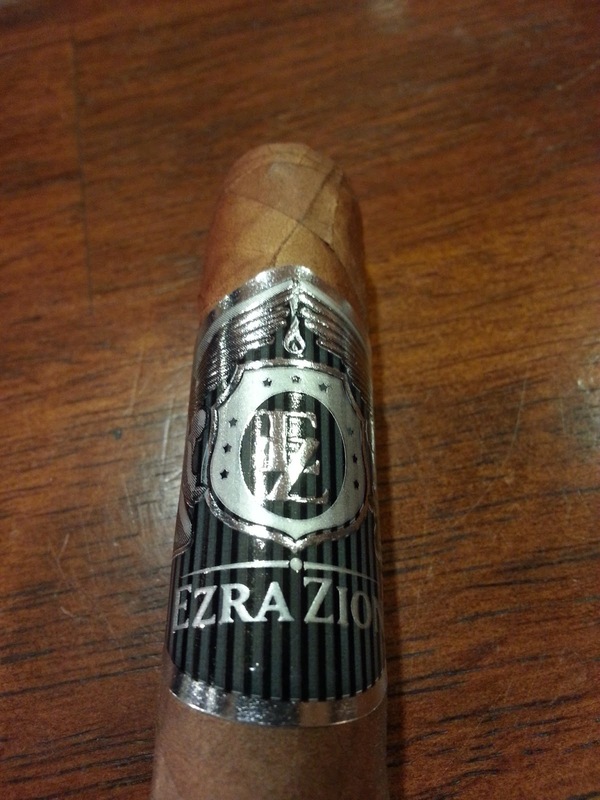 If you haven't grabbed an Ezra Zion cigar yet, don't hesitate to buy some.